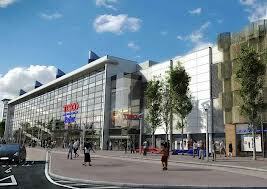 During the Conservative-Liberal Democrat Ipswich Borough Council controlled days Tesco approached the Council with a very large cheque book and requested permission to build a new superstore, a hotel, a piazza, apartments and smaller retail units on the former B&Q site on Grafton Way. Tesco also offered – if they achieved planning permission for the Grafton Way site – to pay for new traffic flow improvements where the flawed double roundabout currently exists outside the Novotel hotel. Total investment would be £90 Million from Tesco. Total jobs would be 900. And that’s not counting the construction jobs which local firms would have enjoyed during the build stage. The Conservative-led council weighed up the pros and cons of such a development (cons very difficult to envisage) and duly gave Tesco planning permission and looked forward to the massive investment and jobs Ipswich was soon to enjoy. Labour had vigorously opposed the investment and new jobs every step of the way. The economy, run by the Labour Government, then took a disastrous turn for the worse and by the time Labour took control of Ipswich Borough Council in 2011 Tesco were wondering if they could afford to go ahead with such a scheme. Their new chief executive, Philip Clarke, ordered a review of their proposed developments. Despite this, Tesco proposed to still invest in Ipswich but perhaps with just the superstore element of the scheme, which would still create hundreds of jobs and payment for the road improvements. Labour’s response was not to promote Ipswich as an area where Tesco would be welcome to spend their cash and create much needed jobs for local people. Instead, Labour councillors made it perfectly clear to anyone who would listen (local paper, radio, TV) they didn’t want to do business with Tesco and in fact hated Tesco so much they opposed their smaller investment into a site in East Ipswich only to find out Tesco weren’t seeking planning permission – it was Sainsbury’s. Needless to say when Tesco’s planners at their Cheshunt HQ were deciding where in the country to invest millions of pounds they concluded it was not worth their while to tackle rabid socialists in Ipswich on top of the challenges of developing their business in very difficult economic times. So they pulled the entire scheme, superstore and all. Bye bye millions of pounds and hundreds of jobs. I bet Cllr David Ellesmere and the Ipswich Labour politburo were very pleased with themselves. I can hear them now in Silent Street patting each other on the back for helping to keep people on welfare payments and trapped in their council-owned homes. And today we learn the consequences of Labour’s hatred of enterprise and business. 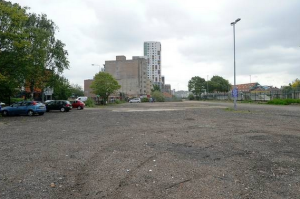 Tesco have put the Grafton Way land on the market with the Borough Council promoting the site for sole residential use which will bring in only a fraction of the investment Tesco’s scheme would have ploughed into the Ipswich economy. Consequently, this part of the Waterfront from the ‘wine rack’ down to Princes Street bridge will be derelict for many years to come. But why should we be surprised by the destructive economic policies of Labour. Ipswich docks was one of the last in the country to be privatised and so the kick-start to regeneration of the Waterfront was ten years behind towns with similar inland ports such as Bristol – with the Ipswich redevelopment only taking place from 2003 onwards. I wonder who was in charge of Ipswich when towns like Bristol were investing for the future in the early 1990s? Yep, you guessed it. The good Old Labour party. Categories: Politics | Tags: Cllr David Ellesmere, Conservatives, derelict, Grafton Way, Ipswich Borough Council, Labour, Tesco | Permalink. Cornhill re-development catalyst for Ipswich renewal? I recently walked through Ipswich town centre with my parents and I was pleased by how much “good” I could point out. We walked from Christchurch Park through to the Novotel roundabout (we had eaten a couple of nights before on the Waterfront) and during this short walk I first pointed out the map-based monoliths and associated signposts. These were implemented by the last Conservative-Liberal Democrat coalition at the Borough Council, spearheaded by my wife (can’t forget that!) Cllr Tanya Maclure – Labour were opposed to the scheme. My parents replied they had used them a few times to help them navigate the town centre when my wife and I were not around. 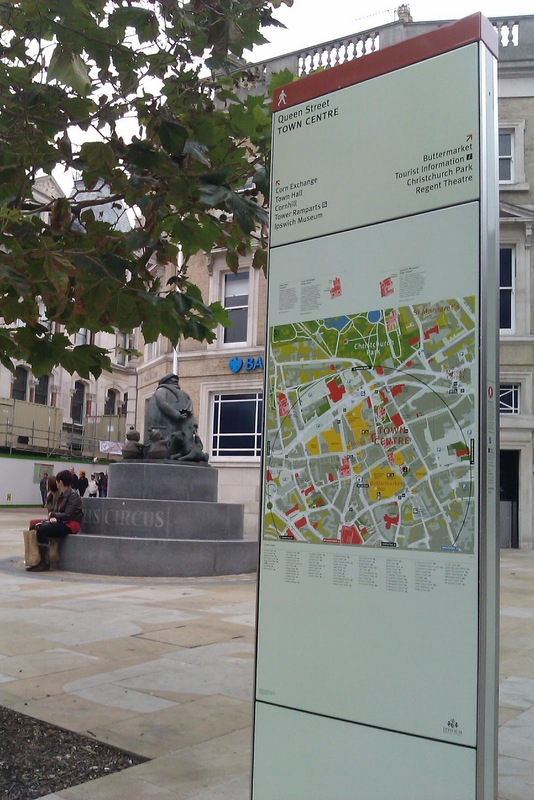 They also recalled they were given a map of the town centre by their hotel receptionist (part of the Council’s signposting scheme). All good stuff. We quickly darted past Carr Street (undoubtedly a blot on the town centre landscape) and headed for Buttermarket where we ended up at Giles Circus, transformed under the previous Tory-led council (again Tanya was heavily involved!) to make it more pedestrian friendly and to make it look aesthetically pleasing – Labour were opposed to this economic growth scheme as well. Waitrose, happily, were not. They set-up a Little Waitrose shop shortly after the renewed Giles Circus was completed and have been trading since. We didn’t walk across the Cornhill, which was a shame because the market wasn’t operating that day. But I hope when my mother and father visit next time, Ipswich Borough Council will be getting on with redesigning the Cornhill to make use of this fantastic space. 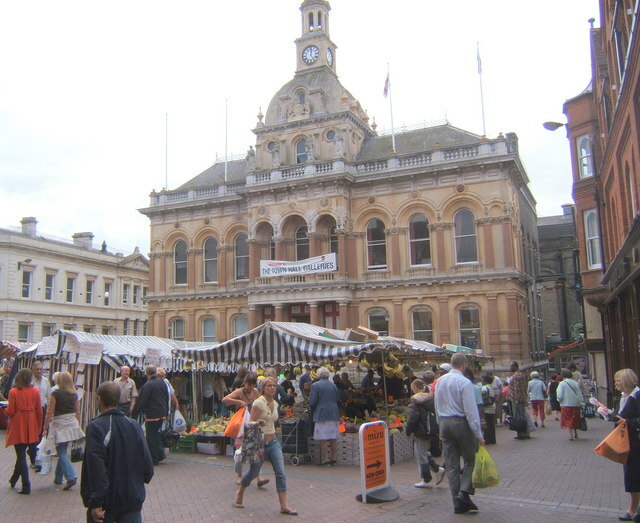 This was the brainchild of Marks & Spencer boss Sir Stuart Rose, who when speaking at the second Beacon Town Conference in Ipswich last September, challenged civic leaders to do something with the Cornhill and get rid of the tatty market. Cllr Ellesmere, being the schoolboy politician he is, glowed and jumped up and down when Sir Stuart made his recommendation. His partner, Cllr Carole Jones was less impressed and suggested in front of Sir Stuart Ipswich was “fine” and he “just didn’t know it well enough” – by all accounts her intervention was a touch embarrassing, but then when did Labour politicians get business and enterprise? But Sir Stuart is a wily operator and knew his very public recommendation would have to be taken up. 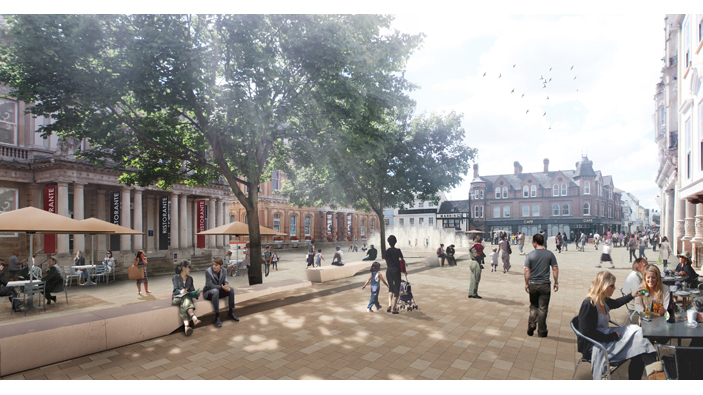 So Ipswich Borough Council over the last year put out to tender proposals for a re-designed Cornhill. The proposals are now in and have been whittled down (not sure how this was done and using which process – hopefully it was councillor not officer-led) to five competitors for public consultation. 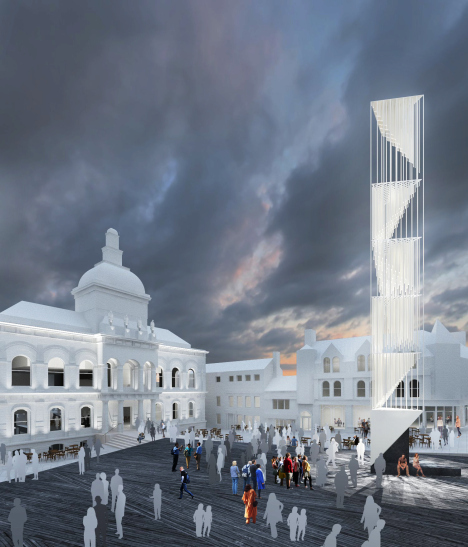 The architects’ designs can be viewed at the Town Hall or online (naturally) at http://www.ipswich.gov.uk/cornhill. Sir Stuart set an original budget of £200,000 to make the changes but local government being local government the budget has increased to £3 Million (which will come from various tax payer funded pots). To be fair even Sir Stuart’s estimate was somewhat unrealistic for a town square redevelopment but for £3 Million I expect a very good result indeed! I prefer Concept A or B and at a push I’d probably choose B. Concept C looks like the opening scene of 2001: A Space Odyssey so I’ll pass on that one! However, I’m not sure what Lloyds Bank think of their front door being turned into on-street cafe in Concept A and B? I’d recommend Ipswich residents reading this to go to the Council website and choose your favourite design. This is a great initiative kicked off by Sir Stuart and once implemented will boost our town centre, which means more people with spending money and more people with money leads to better shops and places to visit. This is what the Council is here for in my view: create the environment for economic growth, then get out of the way and let private business and enterprise do the rest. Categories: Ipswich Borough Council, Politics | Tags: Ben Gummer, Cllr Carole Jones, Cllr David Ellesmere, Cornhill, Giles Circus, Ipswich, Ipswich Borough Council, signposting, Sir Stuart Rose, Tanya Maclure | Permalink. An article over at the Ipswich Spy parish demonstrates once again how some people in this country are playing a dangerous game, which could see this country spiral into anarchy. One such protagonist is Cllr David Ellesmere, Labour’s challenger to Ipswich MP Ben Gummer in the 2015 General Election. He has spoken out against MPs getting a pay increase from their current salary of £60,000. The prevailing attitude that MPs should have tuppence thrown at them and they should be jolly well grateful is ignorant. Does Cllr Ellesmere even know what an MP does and stands for? He/she is a legislator in one of the greatest and oldest democracies in the world – in the “Mother of all Parliaments”, to coin a phrase. 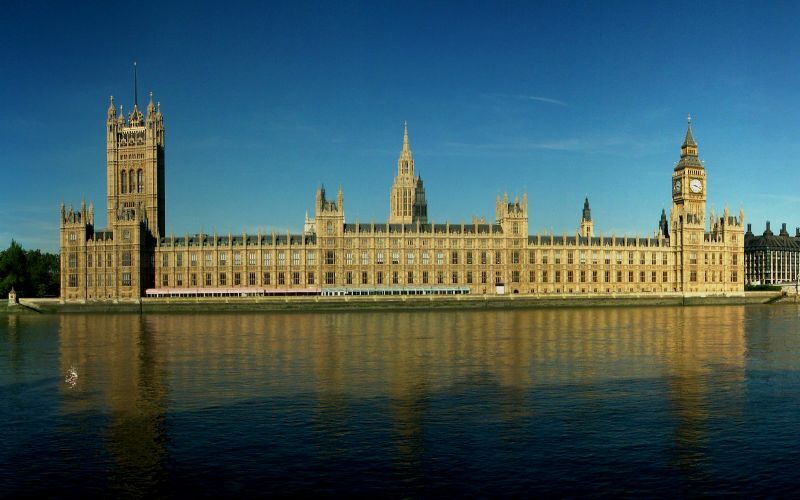 Put aside the work they do to develop legislation and represent their constituencies in the massive machine that is Whitehall, they are the body of democracy in this country! Trivialise MPs and you trivialize our democracy and that is a very dangerous game to play indeed. At the current rate, if politicians continue to be debased in terms of their role and contribution to our democracy it is then a very small step for the population to stop, en masse, respecting our democratic institutions and the rule of law. And then anarchy will prevail – it is closer than you think. MPs have more responsibility than any FTSE 100 CEO and are currently paid less than a middle manager in one of those FTSE 100 companies. I’d pay them £100,000 a year immediately. Let’s take a constituency issue as an example of their work: the railway service for the MP’s commuter constituents is appalling (ring a bell). It’s not just a case of the MP speaking to the Transport Secretary over a quick coffee and hey presto the railway improvement programme is signed off next Tuesday. Instead they must speak with tens of ministers, bag handlers (parliamentary private secretaries to ministers), mandarins (especially to show them where Ipswich is on a map) and build a business case which takes months, if not years – do you have any idea how much someone gets paid to do this in the private sector? This and the slight matter of legislating for the entire country, I think £100,000 a year is a bargain. The same article talks about the pay our councillors in Ipswich receive. As the Independent Remuneration Committee found, compared to most other councils in the country, our councillors are paid an absolute pittance for the work they do. £3000 a year for 15 hours a week. Do you think they live off that? No, most have full-time jobs to pay for food and a roof over their head and then they do another 15 hours plus a week ensuring IBC is democratically represented. This demands respect not insults. If we value democracy, we must value our politicians unless they break the law. If we continue to treat MP-bating as a national sport , all we will do is push power further away from you and I and towards the unelected bureaucrats in Whitehall and Brussels. And with that, you might as well have a dictatorship. Categories: Politics | Tags: Ben Gummer, Cllr David Ellesmere, councillor pay, councillors, democracy, Mother of all Parliaments, MP pay, MPs | Permalink. 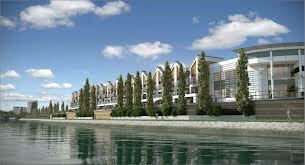 Tesco have pulled out of their Grafton Way development. The writing was on the wall since current Tesco chief Philip Clarke announced a dip in profits last year and said Britain’s largest supermarket was rethinking its expansion plans. Immediately, I feared for the future of the Grafton Way site, which once was earmarked for not only a huge Tesco supermarket (bigger than Copdock) but also a hotel, other shops, a piazza in front of the waterfront etc. The previous Conservative administration at Ipswich Borough Council, apart from one local Tory butcher, were wholly in favour of the new development which would have brought £90 Million of investment into the beleaguered Ipswich economy. But Labour were dead against Tesco from the start, voting en masse against the jobs and infrastructure investment (the Novotel roundabout was to be scrapped and this junction vastly improved) at Planning Committee. Once they regained power in 2011, they threw up the ‘Closed for Business’ sign and made it quite clear they detested enterprise, only half-heartedly welcoming Waitrose and John Lewis At Home to Ipswich on the former Cranes site off Nacton Road. This was more than just a quick jibe at Labour. Business is not some abstract world – it is about personal human relationships. Do you think Mr Clarke’s team looked at Ipswich when they were deciding where to axe expansion and thought “oh yes, we can do business with Ipswich Borough Council easily?”. Nope, me neither. Believe me Labour’s anti-business rhetoric would have been heard at Tesco HQ in Hertfordshire and would have been a major deciding factor in Tesco pulling out of Grafton Way. So Labour managed to lose 900 jobs and £90 Million investment in two years. Good work, Cllr Ellesmere! Categories: Politics | Tags: business, Cllr David Ellesmere, Cllr John Carnall, Ipswich, Ipswich Borough Council, Labour, Philip Clarke, Tesco | Permalink.